On Tuesday, June 12th, visitors to Spiceland Mall witnessed the removal of barrier paper from a previously vacant storefront preceded by Bain’s Sports World. The revealing of the new Art and Soul Gallery was attended by an intimate reception of artists, business owners, and patrons of the arts. This reception represented a graceful and visionary step forward for the cultural community of Grenada as a whole. Proprietor and long-time Grenadian artist, Susan Mains is moving forward with the new Art and Soul Gallery with the assurance that the economic climate will improve. “People ask me if I am expanding because business is good – we all know how business has been. We are expanding in order to position ourselves for the future.” Mains continues, “We cannot sit back and wait for things to improve, we have to make active steps to improve our situation.” This progressive philosophy in business expands into her desire to see the local art community flourish. 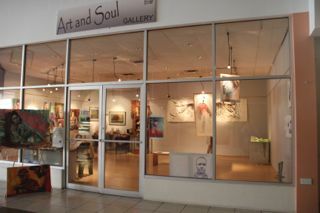 Art and Soul Gallery sets a new standard for the exhibition of visual art in Grenada. The strategic location in Spiceland Mall and the professional lighting and hanging system serve to amplify the contributions of the handful of mature artists recognized locally and internationally. Maria McClafferty’s glasswork can be seen at the new Art and Soul Gallery as well as in Harrods of London, various prestigious locations in the UK and China. Dr. Fernanda Steele works in digital art and has received accolades from the Museum of Computer Art, the Fractal Art Museum Enterprise and the Truly Virtual Web Art Museum. Oliver Benoit has been painting for over 35 years and creates abstract pieces using a variety of media. Benoit’s work perplexes and engages audiences regionally as well as internationally. Marie Messenger contributes ceramic figures that are expertly produced using a technique called Raku. The details of her figures are provoked from the clay adoringly and the highly collectible pieces seem to pause, as if in midsentence. Rene Froehlich utilizes objects that are both natural and industrial in his beautiful and sensual sculptures. Professionally trained in Germany, Froehlich offers some of the highest qualities of craftsmanship available in Grenada. Stephen Mains, oldest son of Susan Mains discovered his muse in the absence of his childhood environment. The horizon is his muse in paintings depicting rich, uncluttered, memories of this important visual influence. Asher Mains’ paintings have evolved over the last 17 years and are known for striking portraits and experimental painting techniques. Asher’s work has been exhibited regionally and contributed work to the Grenada Pavilion at the Shanghai Expo in China. Susan Mains also features her own work representing a lifetime of discipline to her craft and inspiration from growing up in Grenada. Her paintings are also internationally sought after. Art and Soul is not a new comer to Spiceland Mall but has been doing business there for the past 10 years. Originally one store that included book and music sales alongside art, it eventually branched into two stores, one primarily for books and the other for art and art related products. With this new, third location in the mall, the gallery space can truly flourish as a dedicated art venue. Art and Soul Books will continue the sale of books and music and Young Art and Soul will be in the rapidly growing children’s books market. The new Art and Soul will be open Monday through Saturday from 9:00am – 4:00pm. We accept Visa and Mastercard and can ship globally via Fedex.